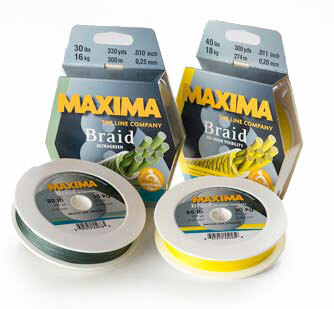 proudly introduces BRAID Ultragreen and BRAID High Visibility (yellow). which leads to an exceptional castability and to an outstanding abrasion resistance. MAXIMA’S BRAID is pre-stretched and heat-fixed. The new BRAID is available in 150 m/150 yd and 300 m/300 yd spools from 10-80 pound test.